Don't worry about it too much, I have to go to school myself right now anyway. Here we go, finally a place that allows me to upload. 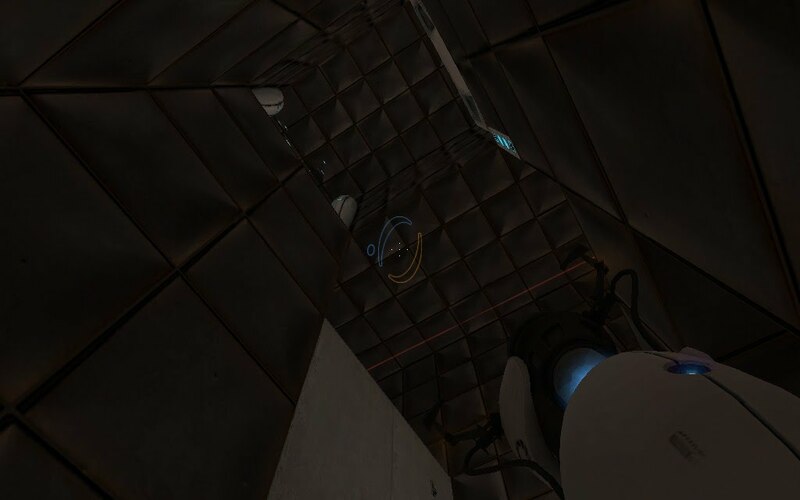 The quality may be bad, and the resizing makes it even worse, and maybe there are 3-4 buggy frames every time I go through a portal (demo recording issues) but it should be understandable. Also, it doesn't end well. Ok i'm completely stuck. I'm at the point after getting (or missing) the cake. Went down, past the turrets, through the short tunnel where u crouch and jumo over the pipes and enter the room with the 2 aprture trucks. There's a red arrow above the second truck and (probably a tunnel). How the hell do I get up there?? There is a sparking button. Alright, I started the video walkthrough but I only did the first part up to the crusher. Also, I need someone to say what I tell him (or her) to in the video. I can do it myself but I for some reason don't want to put my voice on the Internet. I'm completely stuck on this one part after getting past the wrecked offices you go through after the jammed door. I can't see any place to project enough forward momentum to get me to the platform and door (around the corner on the right side of the picture). I'd help out with the voicing, but I don't feel my spoken English is up to the task. Thanks again, though! I'll tell you all when I finally finish it! Grey Fox, there is an X mark on the ceiling, put a portal on it, and another one after the stairs, You'll get the idea. I still don't get this one, putting portals on both the red Xes doesn't seem to allow anything special that I can see. Anyone have a more hints or a video? P.S. Thanks for the map pack (and the flash game), it's awesome. place a blue portal on the ceiling and a yellow after the stairs, jump into the yellow one and fall from the ceiling, then while mid air, open a blue portal on the floor and fling yourself out from the yellow one. Anyway, once again, excellent maps, thanks. I can get the first cube on the button but I apparently need to shoot through a hole (top left) that is higher up. I've got close by using the portal setup in the picture. I would fall 3 times then try to shoot a blue at the floor in front of the hole (bottom left in the pic). I can't seem to do it though because the corner is too close. First of all forgive my english, because I don't speak english very well. I'm stuck in the room whith the red death field with two buttons under, you have to activate it with cubes, but actually I can only get one because the machine that creates cubes fall appart when I get one. I think I have to came with the cube from the previous room, but the door now is closed and have no save game outside the room I'm stucked in. And please create a complete Video Walkthrough. See first page (or second), I already answered that. Or maybe it was in another thread, probably locked. It's basically start an infinite loop and put an out portal on the platform under the hole. Well, if I look up to the tube where the cubes fall I can see threr cubes that don't fall and and red arrow pointing to an air conduct, but I can't shot a portal into that conduct. I'm also stuck on this part, any help would be appreciated. Yes, I was greatly over thinking it. Also as a hint for later: I had a problem jumping, but somehow if I looked down when I did it, I could jump greater distances. Just looking forward when I ran didn't get me a larger jump. Maybe that's just me. Oh yeah, I remember that one. Step one: kill turret. Good luck with that. Save it and come back, I'll give better help. I've got a video walkthrough up on my site if you're stuck. I couldn't really determine where each level started or ended so I just broke it up into 10 minute chunks. I saw you made some stupid mistakes. Most are tiny, but some are just time wasters. First one it that the turret in the end of the crouch tunnel close to the beginning is broken. Should have showed that. I only now watched it, now I'll continue. I'll edit if I find more mistakes. EDIT: Actually, I don't want to watch it now but good walkthrough! I am using the FIRST SLICE and i get up just passt the part where you fall out of the air ducts after seeing the gun that doesnt shoot. I get to the room with 2 doors and a emancipation grill. it says AI disabled and neither door will open WTH DO I DO???? Wait, are you a bot? I don't know what the Demo is like, but if you have a working console try putting AI_disable in there after that happens, see if it helps. I don't remember that part either, but whatever. i reckon it could be. If it answers this question its not. What was the first chapter in HL1 called?